ExxonMobil Indonesia - ExxonMobil is a reputable and leading foreign investment (PMA) company in Indonesia that is involved in oil and gas industry. ExxonMobil Indonesia upstream and downstream oil and gas industry. ExxonMobil Indonesia is a local member of Exxon Mobil Corporation (ExxonMobil Group, NYSE: XOM), one of the argest oil and gas companies in the world. 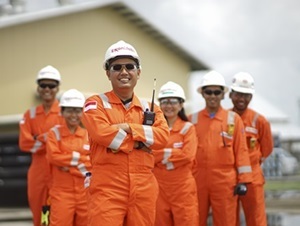 According to information found in ExxonMobil Indonesia's website as cited by JobsCDC.com, ExxonMobil Indonesia shares a rich history in the development of the Indonesia’s oil and gas industry that reaches back over 120 years. The first ExxonMobil Indonesia Marketing office opens in 1898. ExxonMobil Indonesia is based in Jakarta and now has upstream oil and gas facilities in Cepu Block at Central Java. ExxonMobil Indonesia holds 45% of the total Participating Interest (PI) in Cepu block. In downstream business, ExxonMobil Indonesia involved in lubes and petrochemicals industry that is operated by its subsidiary, PT ExxonMobil Lubricants Indonesia (EMLI). Bachelor Degree in Electrical Engineer with minimum GPA of 3.50. Bachelor Degree in Civil Engineering with minimum GPA of 3.50. Good communication skills both verbal and written in Bahasa Indonesia and English. Ability to adapt to tight deadlines, heavy workloads, & frequent changes in priorities. JobsCDC.com now available on android device. Download now on Google Play here. Please be aware of recruitment fraud. The entire stage of this selection process is free of charge. ExxonMobil Indonesia - Fresh Graduate Engineer ExxonMobil June 2018 will never ask for fees or upfront payments for any purposes during the recruitment process such as transportation and accommodation.